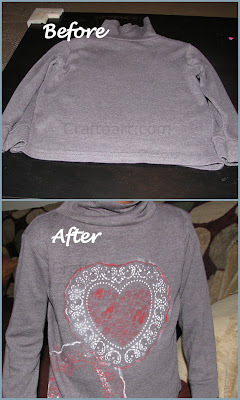 Place a Cardboard or clipboard inside the T-shirt so that the paint won't bleed through. I saw the idea of placing the clipboard at a blog, I don't remember the blog name. Place the doily on the T-shirt at the place where u want the print. Be careful not to move the doily while painting or you can glue the doily to the shirt with a glue stick and remove it after painting. Gently, carefully take/peel out the doily and let your kid adore their creation. Cut the inner heart shape of the doily and use it as template to cut a heart out of the bubble wrap. I was trying to be over smart:-( and placed the painted doily to make a second print below. But the print didn't come out good. Since the paint had spread out in the corners of the doily prints, to give a neater look I drew thin outlines of the doily with the fabric paint. Let it dry and Set the fabric paint according to the manufacturer's instructions. We made the doily print and bubble wrap print same as above taking special care and correcting the previous errors(Neater finish). 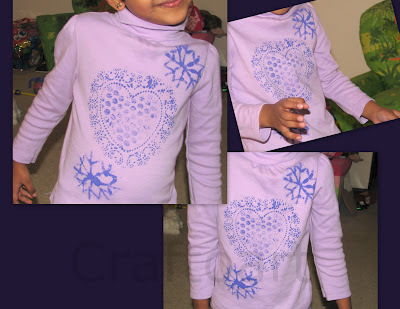 After that we made Pipe cleaner snowflake prints on top and bottom of the heart. We are taking part in the Collaborative Heart Project Fundraiser organized by Jaime at Hands on as we grow and contributing this project for the event. Oooh those turned out very pretty! Those turned out beautifully! My daughter doesn't like plain clothes either, so I have had to get creative with some of them to encourage her to wear them more. =) I will keep this in mind when we have another fashion emergency. These are so beautiful - thanks for sharing this great idea - we are definitely going to try with our left-over hearts! Also this is such a great idea Esther! What a great idea - I've not done any fabric art with J yet but you have me inspired to give it a try.